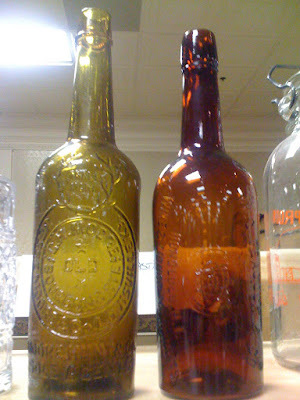 Wormser Bros. Vertical Embossed Flasks Pre 1872? 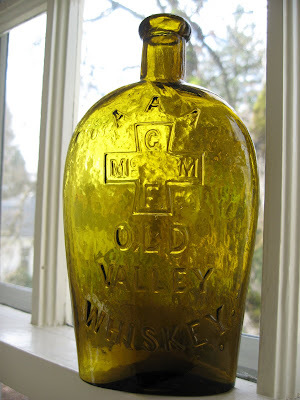 I have always been attracted to the earlier Western flasks. 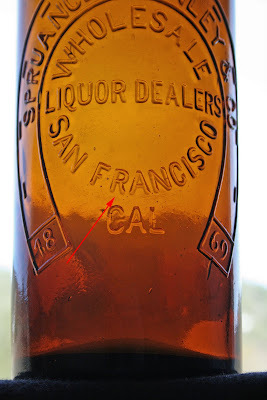 Some of the earliest are the Wormser Bros. flasks from San Francisco. The horizontal embossed Wormser is supposedly as early as 1865(? 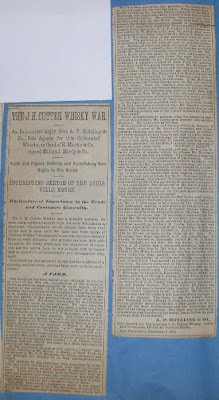 ), and the "Fine old Cognac" about 1872. 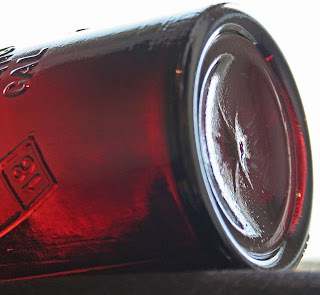 The more commonly seen vertically embossed flask is listed in Thomas' book as being manufactured from 1867-1872. I believe thay may have been that early, however I also think they were made for much longer...perhaps as late as 1878! The company was sold to Richard Braeg ,Albert Dallemand ,and E. Frank.in 1872, but I believe these flasks continued to be produced during the time between that time, and when Jaines Walker joined the firm in the late 1870s. 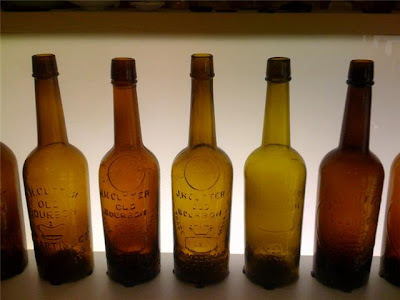 The horizontal embossed flask, and the Fine old Cognac were not being produced after 1872 in my opinion, but the vertical Wormser exhibits charactaristics of being very early ( large tops,dark chocolate/olive, olive green, to yellow green) They also have strong crudity. I have also seen examples which seem to have extremely bold embossing, and tiny applied tops. These are in plain amber, and sometimes off shades of amber. Interestingly, the earlier examples have typically weaker embossing than later blown specimens, which should be the other way around. If the mold was reworked in the mid 1870s, they cut the letters exactly the same,or the glassblowers in the early part of the run had TB, or COPD,as I have compared them. I would be interested to know others' views on the length of the vertical Wormser run. You do not find them in my neck of the woods, or at least did not before 1989 when I dug in Oregon. Did Holt Glass Works even exist ?? I'm pretty sure it did, but who founded it and how long it existed needs to be more clearly defined. A while back I tried to research Holt Glass Works and came up with rather inconclusive findings. I started my research by reviewing the Berkeley 1892,1894, and 1897 city directories and did not find ANY glass works in the business section, and furthermore I could not find anyone with the last name of "Holt" living in or doing business in Berkeley during those years. Next, I investigated the 1900 census and found a William Holt (born in England) living in Berkeley with an occupation of "glass dealer". After reviewing city directories and census records, I decided to investigate the 1901 Sanborn Map of West Berkeley to see if I could find any clues and located a vacant glass works on the corner of 2nd and Addison Street. Could that be Holt Glass works ??????? Unknown. My theory is that the English emigrant William Holt re-opened one of the above vacant glass works between 1896 and 1901. I'm even open to the possibility of Holt Glass Works never existing or being named something else since the phrase "Holt Glass Works" or even "Holt Glass" did now show up in ANY documentation (newspapers, municipal reports, books. ect) published between 1885 and 1922. Maybe a much more thorough investigation of Campbell and O'Neil glass works could shed light on the true history of Holt Glass Works. 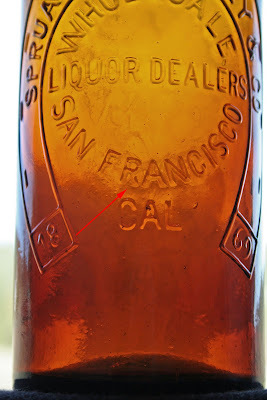 Has anyone researched the years of all the western companies that put out bottles with that base embossed H ? You've heard the saying, if it looks like a duck and quacks like a duck, it must be a ... duck. 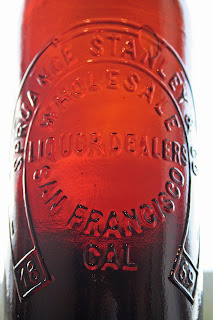 And so if a glop top has a star on the base and those funky little curved legged "R"s it must be a San Francisco blown bottle, right? So, how come this whittled to death glop top Spruance with the star and the R is a blood red bottle that is now commonly referred to as a "German connection fifth"? I don't profess to know, but have compared this one that just came in, along with two others in my collection and all bear identical anomalies. All have the star base and identical "R"s. The "hitch" in the R isn't as overstated as say, a globby J.F. star shield, but it's there just the same. There is a substantial difference in height in one of them (one is an inch shorter than the other two, and no - it's not been chopped and re-glopped) and there's also a radical difference in color between all three (ranging from a dense oxblood red to a bloody orange depending on the bottle) but therein ends the dis-similarities. It's obvious that they all came out of the same mold, although different glassblowers blew and finished them using noticably different batches of cullet. German or S.F.? Comments? Quack, quack? I've just omitted the lousiest photo from this post and I will post comparative photos tomorrow, showing smooth based and star based straight amber embossing comparisons. I'm not trying to prove or disprove anything, but do want to give everyone an opportunity to weigh in on this issue. As promised last evening, note the "R"s in the following photos. I highlighted the curved "R"s with the red arrow. But, if you look elsewhere in the embossing on the straight amber Spruance glop tops, you'll notice a totally different style of R as mentioned last night. This plot really is getting thick! For many years there has been the ever evolving, and controversial "Top 25" for Western Whiskeys. There has even been a recent survey to try and rank the "Top 25" Western bitters. These rankings show collector opinion as to the "weight" of one bottle against another. It sometimes translates to monetary value, but most often is a subjective opinion as to what bottle someone would want to have in their collections compared to others. It is general, and not specific to a particular example. I have seen some lesser ranked whiskeys with spectacular color, and character, and a number 1 ranked example that I did not find attractive at all. So...here is my opinion of the top 10 Western Flasks. There are fewer early flasks than cylinders, or bitters, so a "top 25" would not work in my view.It also does not include two notable flasks: the A.M. Smith Salt Lake City, and the Dr. Hausman's Bitters. These are hard for me to rank as my desire for each is not at cardiac rising levels, though they are unique in undamaged condition. Remember, this is MY opinion only, and is the product of many years of collecting Western flasks, and having great friends and mentors like Ralph Van Brocklin, Jon Lawson, Dennis Eastley, and Bill Anderson. I would appreciate your opinion as to your "top 10". I would like to conduct an actual survey for other collector's opinions. There are not alot of us passionate for the flasks, and most whiskey collectors have a few, usually to pair up with a cylinder. I love the early open face glob flasks the most, and my list does not include any slug plate examples even though they are usually very rare. let me know what you think. I acquired this very light non vented Jesse Moore fifth a few months ago from the original "finder". It needed a light cleaning as it had laid face down in an ashy layer for 120 years or so. The photo does not show just how yellow this one is, but I have not had a lighter example in my collection. These just do not seem to come in nicer colors very often, though I heard of a nice green toned example that walked in to the Vegas show. Not sure if it found a new home or not, but this one is happy with his friends on the shelf! 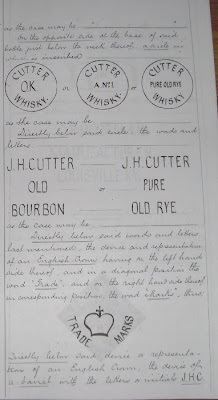 There has been quite a bit of interest in the Cutter OK and A No1 whiskey bottles lately, so I figured that some of his information should be shared with some of you who may not be familiar with it will understand what it entailed. A.P. 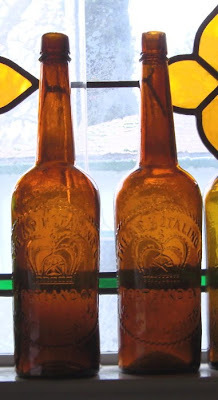 Hotaling trademarked the familiar bottles on 24 March 1881. Some of the following pictures will show the labels, bottle embossing, and paper wrappers that covered the bottles. The entire pages are too many to include, but the highlights are shown below. 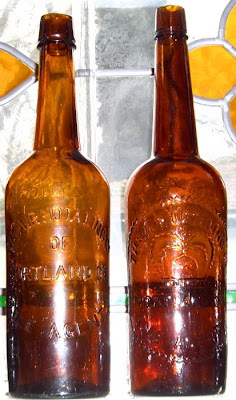 The bottles also wore the familiar red diamond shaped neck label with standing man slaying the dragon and "Death To Imitators" imprinted upon it. This label remained in continuous use from it's trademarked introduction in 1875 until the Co divested itself of the Cutter brand in 1904. 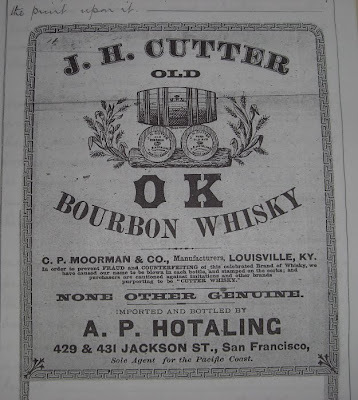 Whether Hotaling actually produced the Pure Old Rye bottle trademarked with the OK and A No1 remains a mystery, as no bottles, or shards of same, have come to light. Hopefully, a digger will turn up some supporting evidence to indicate that the bottle was a production item. I think I might enjoy these Full-faced embossed Cutter fifths even more than their Circle Cutter and Star & Shield companions. 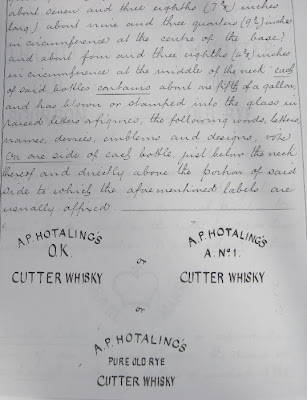 As many are well aware of, A.P.Hotaling suffered through 14 years of proceedings to insure that the rogue E. Martin would forever be banned from bottling his poor quality whisky under the J.H. Cutter banner. Hotaling was, of course, the Sole Pacific Coast Agent for the brand, and had been since 1866, yet Martin refused to acknowledge this fact. 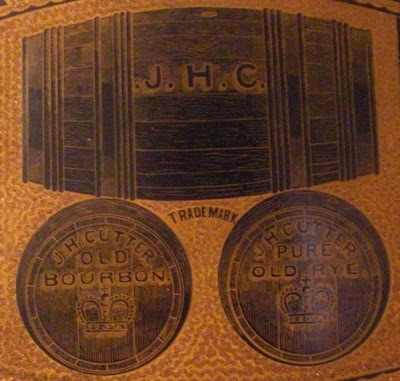 It wasn't until 1884 that the case was resolved and Martin was forever refused the right to bottle any products carrying the J.H.Cutter name. He carried on with his lesser quality and still excellent selling J.F. Cutter Old Bourbon. 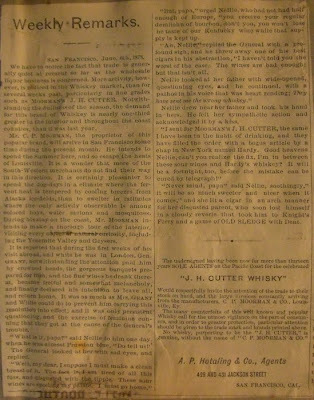 The following clipping explains the situation as it was early in the protracted case. A.P. 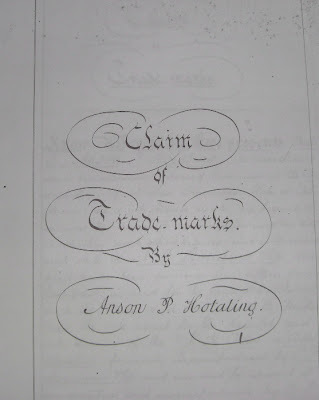 Hotaling's trademarks appear on his bottles, in his advertising publications and on his early advertising signs. To say that he was conscience of his trade marks would be an understatement. He vigorously protected these trade marks and constantly made the public aware that only he was the only agent for the J.H. Cutter brand. It has long been stated, whether truthfully, or not, that U.S. Grant had a propensity for whiskey, notably Kentucky Bourbon. Did he imbibe in the famous J.H. Cutter brand? Or, is this a blatant attempt by A.P. Hotaling to "bend fact" in advertising his wares? No matter the facts, this "article" from the June 6th, 1878 San Francisco Commercial Herald makes for some interesting reading. Or are they? Similar, but quite different if you look closer. The OK is very often seen, it's cousin, the A No 1, is another story. 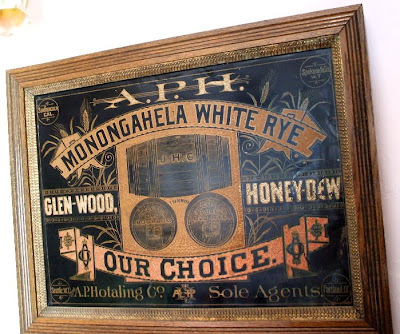 Although these bottles, and their yet undiscovered Pure Old Rye "look alike", were trademarked by A.P.Hotaling in the Spring of '81, it is evidenced by sheer numbers found that the OK outsold the A No 1 by a huge margin. 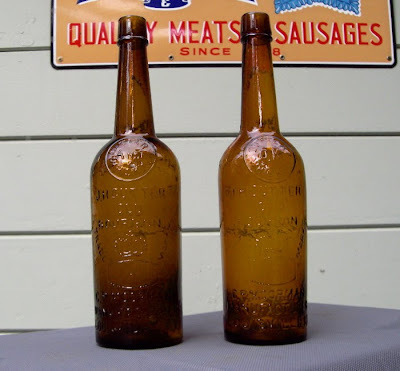 The more common bottle even made it into the "toolie" years, and on into the 1890s. 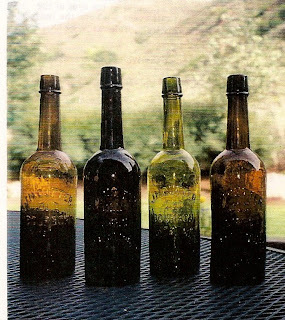 Both of these bottles were found by myself, the A No 1 locally and the OK at a High Sierra mine. To the best of my knowledge, three of the A No 1 bottles have been found here in Sacramento. More than double that many of the OKs were dug in and around town. Both are very light amber and heavily whittled, although the dreary day and poor light, plus my inadequate photographic abilities makes the effect disappear. It may seem strange to many of you that so many embossed glob's have been located in Mormondom. 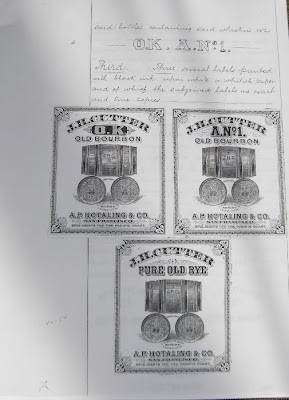 The wholesale and retail liquor industry was thriving in Salt Lake City in the early 1870's, even to the extent that we have two embossed containers from that era... S.T. Suits fifth (Walker Bros) and California Wine Depot flask (A.M. Smith). Although the Walker Bros. became agents for J.H. 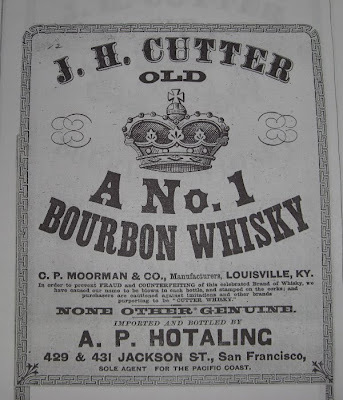 Cutter in 1872, the first agent in Utah Territory for Mr. Hotaling's bourbon was Cunnington and Co.
A venerable establishment, Cunnington & Co. was well established as dealers in dry goods, hardware, clothing, groceries, etc. 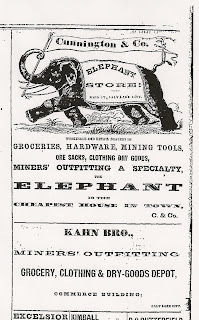 Their familiar advertising, THE ELEPHANT STORE, was seen daily in the local papers beginning in the early 1860's. As has been mentioned before, the transcontinental railroad was the spark that set off the mining boom in Utah. The local merchants, Cunnington, Walker Bros, Auerbach Bros. (recent arrivals from La Porte), Wm. Godbe, and others immediately broadened their horizon and clientele. Instead of limiting their business to the agricultural based "Valley Saints", they decided to become miner's outfitters. 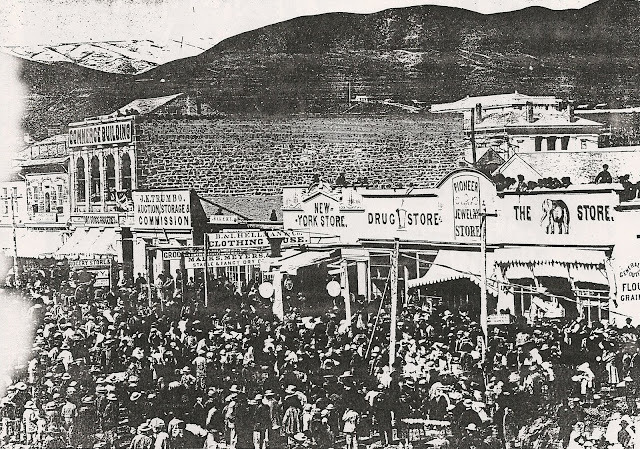 Not only sellers of seeds and broadcloth, they sold picks, blasting powder, fuse, and ore sacks...... and whiskey. After all, a 'real miner's outfit' has to have a bottle or two. The experienced prospectors and miners that poured in were not willing to settle for the local concoctions, Pop Skull, Tanglefoot, & Valley Tan. Something more palate-able was in order. Cunnington & Co. stepped up big, and provided the best .. J.H. CUTTER OLD BOURBON. Years later a few diggers were happy too! This is a favorite photo of mine.. just to prove that the stodgy old Mormons had a sense of humor. The crowd is waiting for the festivities to begin. A tightrope walker is set to perform, maybe on that rope you see just below the Elephant Store sign. A "one legged" tightrope walker! Now that I think of it, maybe there is more to it! Cunnington could have been receiving their first shipment from Mr. Hotaling this day!! Awhile back several collectors showcased their AAA flasks, and all were simply beautiful. These flasks come in a myriad of colors, and crudity. Here is one of my examples that seems to have most of the qualities which are most desired in this (and most) bottles. The color is a light yellow, with green tone, it is extremely whittled, and the strike is crisp and clear. The way to tell if your AAA flask is boldly struck is to observe the outside edge of the cross. If the cross is actually outlined, and this ridge outline is present, it is extremely well struck. If the entire cross is on one plane, and there is no embossed "ridge" but the cross is flat, and drops off at the edge, it is an average struck example. of course the small lettering at each leg of the cross should be legible, and crisp. There are some stunning green examples out there, and the rarity, and prices seem to be in alignment with the Teakettle fifth. the realized prices are pretty close in each with similar charactaristics. Certainly not rare, but VERY popular. Just a stereotypical Western bottle. It's great for this Oregonian to see "OldCutters" post of two nice Portland fifths. Glob top whiskeys from Portland are all tough to find, and do not come up for sale often. 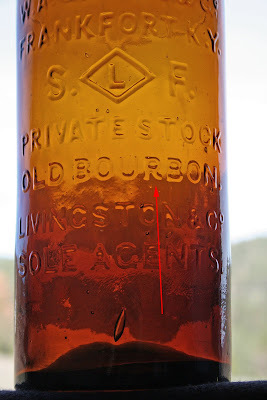 The Hotaling fifths from Oregon have a great tie in to California collectors of early Western whiskeys and finding a good example is not easy. Here is the "other" Hotaling globby from Oregon. This one is hard to find as well. It is a very primitive looking fifth, and usually has nice glass character, whittle and a larger top than the other "Rick Rack". I still have no proof as to which is earlier, and perhaps they were all used close to the same time for different brands of whiskey (?). The timeframe of use is so narrow, for all 3 to be distributed, and all are rare to extremely rare. My recent purchase of another Rick-Rack(T-56) has spurred me to share a photo of it and it's predecessor , the open face Portland Hotaling(T-55). Sorry about the quality of the photo, but this old shack has exactly two windowsills, both of which have colored glass in them. A.P. 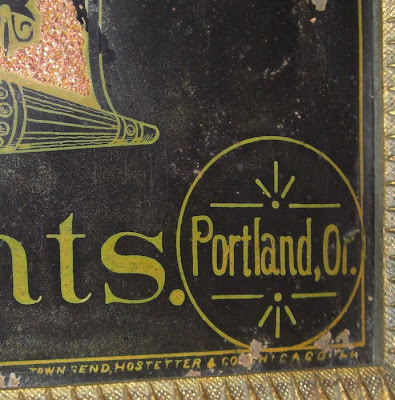 Hotaling opened the Portland, OR, Agency around 1873, and expanded rapidly in the Northwest area. Shortly after he opened offices in Seattle, W.T., as well as Spokane(Falls)W.T. It is generally accepted that the first bottle Hotaling used in his endeavors in the Portland area was the T-55, or Open Face Portland fifth. 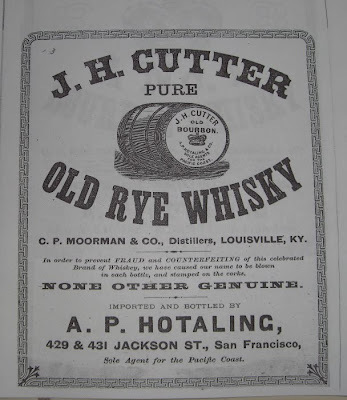 This bottle was probably used to promote his wildly successful J.H.Cutter Whiskey, but could also have been filled with his other big names up there, Monongahela White Rye and Our Choice Whiskies. 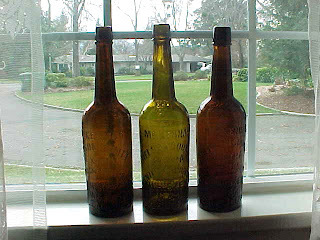 The Rick-Rack came into use in the late 1870s, supplanting the earlier bottle as Hotaling's container of choice for his products. Hotaling remained in Portland until 1894, at which time he sold his interests to the Rothchild Brothers. 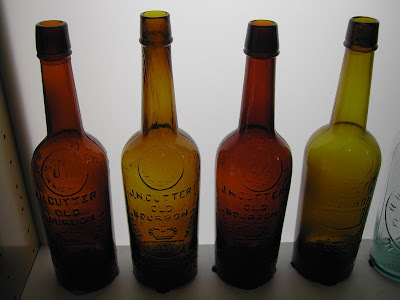 Hotaling also used the more familiar bottles such as the A No 1(T-40), OK(T-41), "Bird"(T-42) and the various molds of the Circle cutter(T-44s), throughout the regions where he had outlets and agencies. 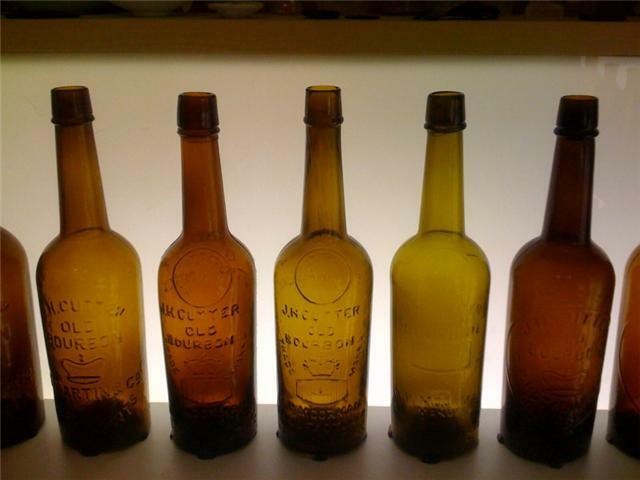 It is likely that the earlier of these often seen bottles were used conjunctively with the ones that were blown specially for A.P. Hotaling's Northwest Agencies. Here is the one I got from Roger. A very nice example in a "greenish" coloration, but not near as green as Richard's. His looks to be really green, a super color in this bottle! Photo taken with an amber Teakettle. I think that Roger told me he obtained this one from Alaska, or was it Hawaii? Check out the C. W. Staurts, McKennas, Untied We Stand and SHM on the barrel ends. Smooth base for western distribution, C&I for eastern, and since they had the bottles, for western distribution when the S.F. glassworks couldn't keep up, or when the east coast venture fizzled. Here are some picts. of a "C&I" McKennas and the more familiar western base McKennas. Note the differences in lettering style or font, C&I is a more slender bottle, top is a bit different on the C&I. I have had a couple of light yellow amber "traditional" ones over the years and one that was quite "greenish". I think it is still hanging out with Dennis R. I keep selling them off to pay for other bottles, then I find I really can't live without one. The C&I examples tend to be medium amber to darker amber. Haven't seen a real yellow or green C&I McKennas in my travels. Another strange thing, the C&I S.H.M.s, that I have seen, are all a beautiful light yellow amber. That is a whole new set of questions.... the S.H.M. Again, more questions than answers about the two different McKennas. These two bottles appear to be in service roughly the same time period. I believe the C&I possibly started just a bit later (late '70's) than the Western base. ?? Size reduction? The C&I bottle is an ounce or two smaller. Don't think that is it.. The non C&I is a transitional bottle, glob and toolie, used well into the '80s. Well past the start of the C&I's.